Ch.7: Wie spät ist es? - What's the time? 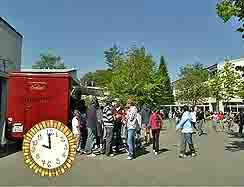 At 10 o'clock, the baker's van arrives in the playground fto sell snacks in the first morning break. Examples from the school timetable: "At 10 o'clock, we have English." In Germany, most schools finish their day much earlier than in the UK. These children go home at 1pm. At 3 o'clock, Marie does her homework. 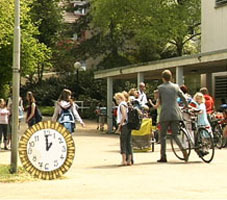 In this section pupils learn how to tell the time in Germany and how to ask what time it is. We also see what German children are doing at different times of day. This shop in the Black Forest makes and sells its own cuckoo clocks; they've built the "world's widest cuckoo clock" next door (according to the Guiness Book of Records, it didn't quite make "biggest").